From the author of The Absolutist comes a propulsive novel of the Russian Revolution and the fate of the Romanovs. Part love story, part historical epic, part tragedy, The House of Special Purpose illuminates an empire at the end of its reign. Eighty-year-old Georgy Jachmenev is haunted by his past—a past of death, suffering, and scandal that will stay with him until the end of his days. Living in England with his beloved wife, Zoya, Georgy prepares to make one final journey back to the Russia he once knew and loved, the Russia that both destroyed and defined him. As Georgy remembers days gone by, we are transported to Saint Petersburg, to the Winter Palace of the czar, in the early twentieth century—a time of change, threat, and bloody revolution. 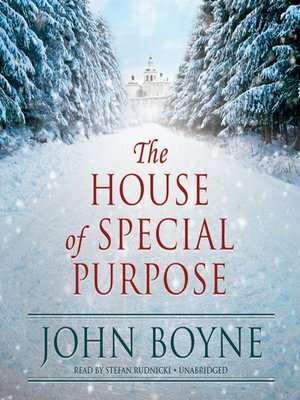 As Georgy overturns the most painful stone of all, we uncover the story of the house of special purpose.